Directly north of Downtown Columbus and the large cluster of hotels near the Greater Columbus Convention Center is the fast-paced Short North Arts District. As soon as you see distinctive lighted arches over High Street, you’ll know you’ve entered this creative neighborhood filled with art galleries, local boutiques and hip restaurants and bars. Accessible via CoGo Bike Share, the free CBUS downtown circulator, several local and express bus lines and best explored on foot, the neighborhood stretches a mile and a half along High Street from Nationwide Boulevard to King Avenue. 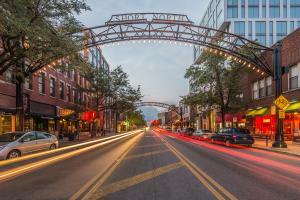 Starting in the 1980s, the Short North Arts District became a hub of the local art scene. Filled with numerous galleries, theaters, shops, hotels and restaurants full of local art, this is a great place to find the next masterpiece to hang in your living room, or to window shop through some outstanding galleries. Hammond Harkins Gallery features the work of present-day local artists, and the alley-way Joseph Editions features limited-edition prints exclusively from Ohio artists. Brandt-Roberts Galleries specializes in mid-century works from local and international artists, and Lindsay Gallery works with local nationally acclaimed folk and outsider artists. The recently opened Pizzuti Collection features rotating exhibitions of modern works. 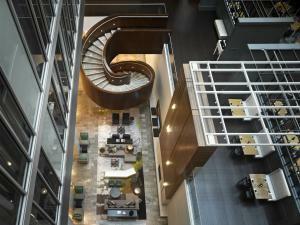 Le Meridien, The Joseph Hotel, the neighborhood’s newest place to stay, and the 532-room Hilton Columbus Downtown are both full to the brim with original local artwork. The Garden Theater features performances and cabaret shows year-round, and local drag phenomenon Nina West performs incredibly entertaining original shows at Axis Nightclub. In addition to its iconic arches, the Short North Arts District&apos;s public art includes some of the city&apos;s most recognizable landmarks. The famous Short North Gothic mural, which is painted on the outer wall of the beloved Jeni&apos;s Splendid Ice Creams, turns art on its head to embody the spirit of the neighborhood. Though not visible from High Street, the nearby Mona Lisa mural is another important symbol of the area, and is similarly intriguing for its sideways depiction of its subject. The Short North Arts District&apos;s popular mural series is called BLANK SPACES to acknowledge the murals&apos; temporary occupation on, and beautification of, otherwise blank brick walls. Whether you’re in the market for some new clothes, home goods or baked goods, the Short North Arts District is a prime spot to browse. Boutiques like Rowe, Ladybird and Happy Go Lucky Her carry fashionable women’s clothing. Tigertree, Artisan Deluxe and Homage carry stylish men’s and women’s clothes, while Cub Shrub caters to the under-six set. Mid-century lovers will want to explore the vast vintage collections at Grandview Mercantile and Flower Child, while modern home goods can be found at Happy Go Lucky Home, Old World New Home and the T. David Collection. Laughlin’s Bakery offers delicious breads and pastries perfect for a picnic in nearby Goodale Park. You’re never far from a great sip or bite in the Short North Arts District. 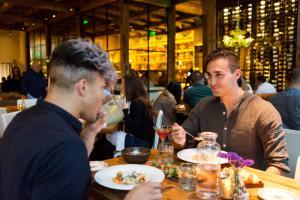 At the neighborhood’s southern end, The Pearl offers oysters and outstanding chicken and waffles, Marcella’s has Italian bites and The Guild House offers an upscale menu. Further north, Hubbard Grille delights with modern American dining, Bakersfield serves up delightful tacos and margaritas, and Forno combines craft cocktails with delicious wood-fired pizza. Northstar Cafe serves up healthy salads, fluffy ricotta pancakes and the best veggie burger anywhere in a casual environment. Nida’s Thai, Condado Tacos and Lemongrass Fusion Bistro offer a more international take on dining. 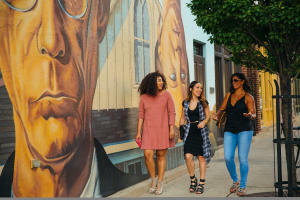 A great time to visit is the first Saturday of every month for Gallery Hop, a 32-year-old tradition when galleries and stores stay open late and entertainers line the streets. HighBall, the nation’s most elaborate costume party, shows off the best of Columbus’ outstanding local fashion scene and brings national attention in each year just before Halloween. 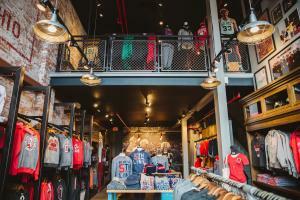 Neighborhood-wide sales happen at various points throughout the year, and are great times to snag some fashionable new clothes. Nightlife options abound, with craft cocktails at Mouton and Denmark on High, dancing at Scully’s, Union and Axis, and laid-back board games, complete with a full beer and wine menu at Kingmakers. Directly east of High Street is Italian Village. New energy is transforming this spot into a nightlife hub. Little Rock hosts live music, Seventh Son Brewing uses its creative energy to craft category-busting beers, and Hoof Hearted Brewing combines heavy-hitting brews with a thoroughly mod taproom. In the daylight hours, check out The Market Italian Village for upscale picnic supplies and delicious pizzas, or the sunlight-drenched Fox in the Snow Cafe for an outstanding latte. 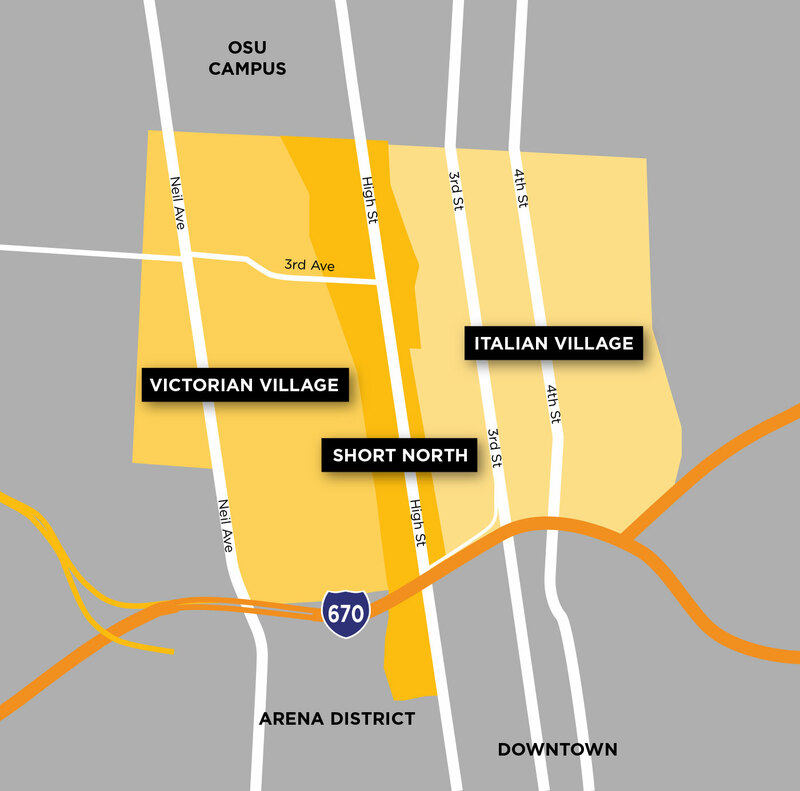 To the west of the Short North Arts District, you’ll find the mostly residential Victorian Village. As the name suggests, there’s outstanding Victorian architecture, but also some standout destinations, like the huge Goodale Park. 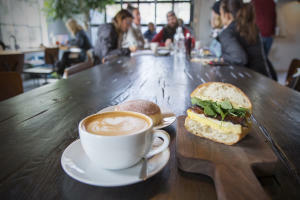 Tucked-away and crave-worthy dining includes Katalina’s for Latin-inspired breakfast and lunch items, including Nutella-filled pancake balls, and the cozy Basi Italia for ingredient-driven modern Italian fare with a relaxed and leafy patio.